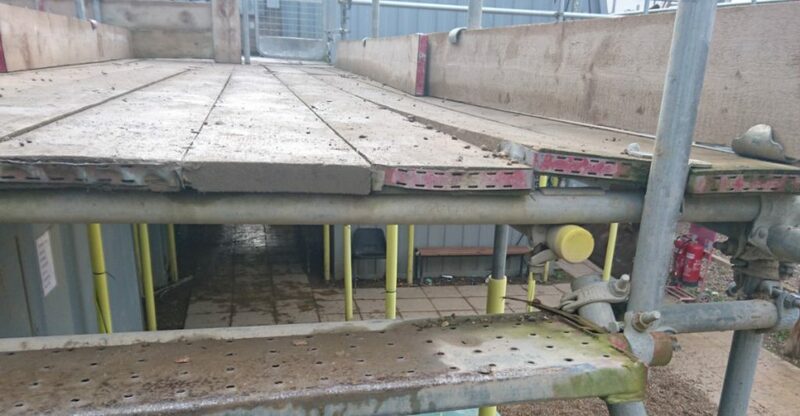 Platforms within tube and fitting scaffolds may be constructed using various permutations of decking units and materials, however timber scaffold boards are most commonly used. These boards, when manufactured according to BS 2482:2009 should have a nominal thickness of 38mm with a width of 225mm. They are available in both metric and imperial lengths of up to 13 feet (3.96m). In most scaffolds the first case occurs. Looking at these values along with BS 5268-2:2002, which was current at the time BS 2482 was created, we can work out that it refers to timber of C24 strength class. It is based on assumptions of Service Class 3 and medium-term Load Duration Class (up to 6 months). 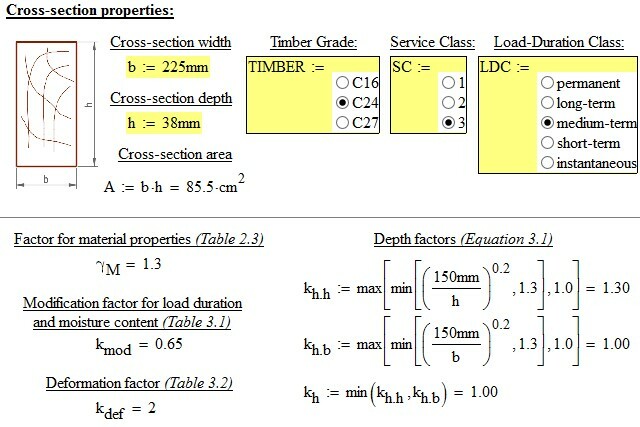 Below is a comparison for the same timber cross section, but the bending capacity has been calculated to Eurocode (which one?) standard. As we can see from Figure 1 the bending capacity based on Eurocode is almost 70% more compared to the superseded BS 5268:2. 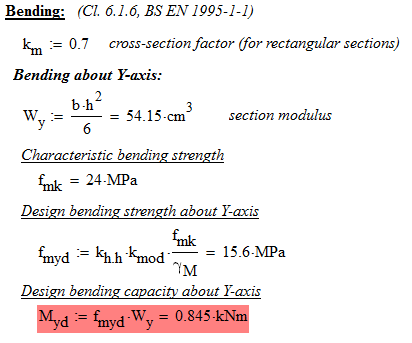 Taking this into account, in the following part of this document we won’t refer to a maximum allowable bending capacity, but rather rely on a section modulus which is not relevant to design codes. As we can see, doubling the thickness would increase the board bending capacity four times. However, using such thick boards would not be very desirable, practical or safe on site, as a 13-feet long by 76mm thick board would weigh almost 50kg. In simple terms this means that we can safely double up the working load applied to the deck. Further investigation must obviously be undertaken to ensure that transoms, beams etc. allow for increased loads. With a sufficient number of nails or screws to make the double boards work together they could be treated as one solid section of timber, meaning that their bending capacity could be increased four times. 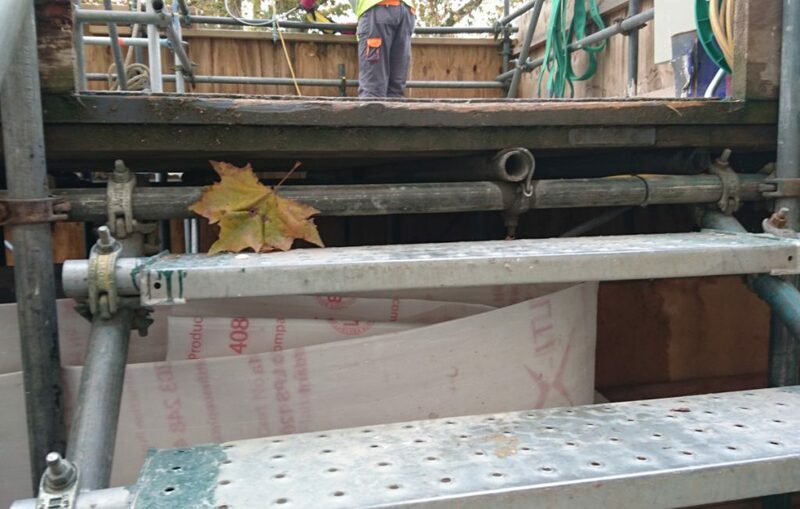 However this is not always practical, therefore sourcing board connectors which can provide enough strength but can still be easily removed when the scaffold is struck is one solution. An alternative method is using plywood on top of the scaffold boards. However due to its limited thickness (typically 10mm) the bending capacity is negligible compared to 38mm thick boards. As previously discussed, the effectiveness of the plywood could be increased if it is screwed down to boards below. Occasionally this happens on site, but is not perceived as increasing deck bending capacity and further calculations for integer cross-sections should be undertaken. Plywood on top of boarded/double-boarded scaffolds also has a different purpose, as it spreads the load over at least two boards below. It is most significant where extreme point loads are applied to the scaffold decks i.e. brick palette wheels. Thicker plywood use may work so that three boards below are supporting the loads applied, which in turn means a much smaller deflection of the deck. As we can see, the theory behind scaffold decks and boards is far more complex than just putting one board on top of the transom. Accurate calculations may improve material usage and therefore reduce the total cost of erecting the scaffold.